Email gift certificates from gracebeads.com make wonderful last-minute gifts and are a great way to share the beading experience with friends and family. 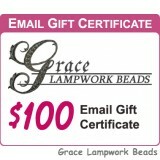 Email gift certificates are sent directly to the recipient's email address or to yourself. 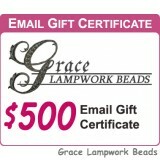 If the recipient exceeds the gift amount when shopping, the balance can be paid by credit card or other payment method. 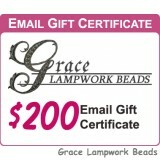 Contact us at info[a]gracebeads.com (change [a] to @) or call us at 866-965-9966 for more information. NOTE: Coupon discounts CANNOT be used for the purchase of email gift certificates. Redemption rules: Email gift certificates can only be redeemed online at Gracebeads.com. 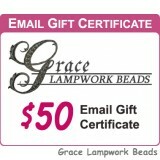 The codes on the gift certificates cards are transferable, so treat them like cash. They cannot be redeemed for cash.